Dual compartment chassis shows off your better bits. Lian Li is back with another dual chambered case that separates your components into two distinct compartments. As Lian Li describes it, the new PC-09 is like having "two different cases fused together as conjoined twins." It's an odd comparison, though strangely fitting. The PC-O9 is a two-faced case with tempered glass on one side to show off the motherboard and graphics card, and a windowless brushed aluminum compartment on the other side for the less flashier parts of your build, such as the power supply and storage drives. Lian Li's newest case dismisses the notion that you might want to show off certain drives and PSUs. Intel's 730 series SSD with a skull graphic comes to mind, though flashy PSUs are a bit harder to find (OCZ's old PowerStream with a mirror reflective finish was snazzy looking). The PC-09 is a mid-tower case measuring 354mm (W) x 482mm (H) x 465mm (D) and weighing 8.6kg. Lian Li lists support for standard ATX and micro-ATX motherboards, which means a mini-ITX motherboard should also work. The size of the case is overkill for a mini-ITX mobo, but as far as mounting one goes, it uses the same hole placements as four of the holes in a regular ATX configuration. You can fit a graphics card up to 290mm in length (as a point of reference, a GeForce GTX Titan X measures 267mm). The case also supports PSUs up to 290mm in length and CPU coolers up to 160mm high. A drive cage in the windowless compartment of the case holds up to six 3.5-inch hard drives, with room for an 2.5-inch SSD on both the top and bottom. Two 120mm fans attach to the back of the drive cage providing active airflow for alll eight storage devices. Cooling is a point of focus here. From the press photos we've seen, it doesn't really appear to be an open-air design, as Lian Li describes, but there are several fan mounts. Lian Li includes three 120mm fans for the front of the case and there are several more throughout. You can also liquid cool with support for up to a 360mm radiator in the top and front. Rounding out the feature-set is a built-in LED dimmer, removable dust filters, rubber lined cable cutouts, and a front I/O with four USB 3.0 ports and HD audio. 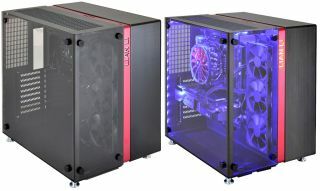 Lian Li's PC-09 will be availble in mid-June for around $400 (€350).